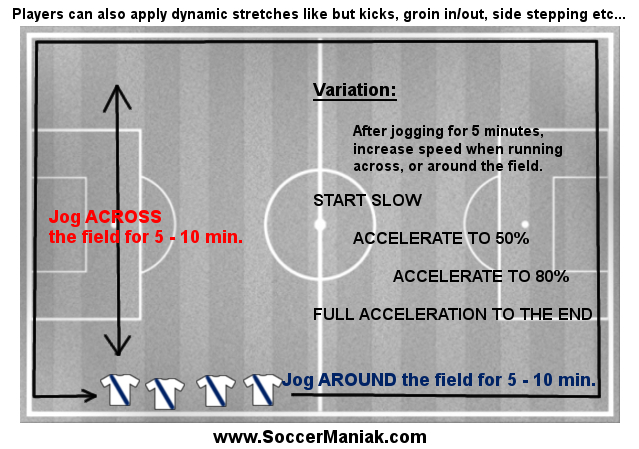 Warm up drills for soccer can be adapted from many soccer drills. This warm up drill is a great way to teach the players importance of teamwork and communication, while at the same time working on player’s agility and quickness. Set up the grid or square that is about 20x20 m/yd all around. Make the square bigger if needed. Split up the players into 3 – 4 teams, with 3 – 4 players on each team. I always enjoyed playing for a Coach that would demonstrate any soccer drill, so the players can visually see how the training drill is done, especially when doing it for the first time. Each team or group of players will form a line by standing one behind another facing forward. Players will place their hands on the shoulders or hips of the player in front of them. Throughout this soccer drill, players are required to be holding on to the shoulders, or hips, without breaking contact. Once all the teams are connected and ready to go, players will start the drill by trying to tag the last player of the other teams in the grid, while at the same time staying connected like a snake. Player in the front is the leading point, or the head of the snake, and will attempt to lead the other players behind him/her in pursuit of tagging the last player of a different group. Players will have to stay connected with hands on players shoulders, or hips, in front of him/her. If the chain is broken, or the whole team goes out of bounds, than that team will be eliminated. Player in the back of the line is tagged to eliminate that whole team. Continue until all teams are eliminated, but one. Players of all ages will enjoy this soccer warm up exercise. 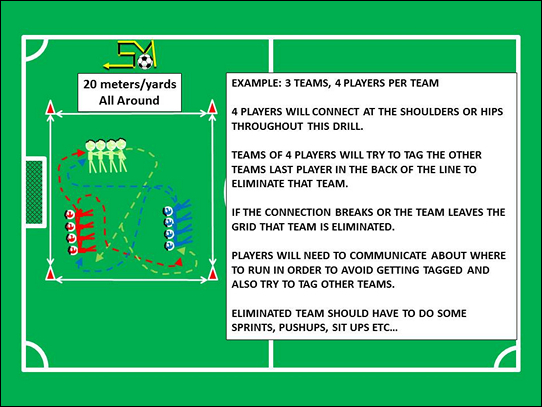 Encourage players to communicate where they want to move, or where to run if the team is in danger of being tagged. Communication is a big part of this soccer drill. Players will have to work together in order to protect the tail end player, and they will have to communicate on advancing in the correct direction to try and tag other teams. Modify this warm up drill by adding or subtracting players from the chain, or snake. Add more teams and expand the area or grid. Time the drill for 5 - 10 minutes.